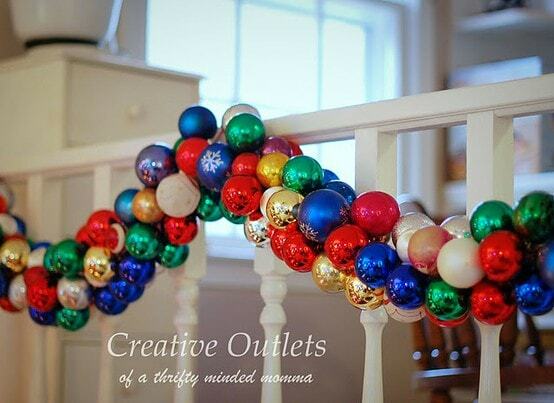 Last week I came across this GORGEOUS Christmas ornament garland from Creative Outlets of a Thrifty Minded Momma while surfing Pinterest. Thought this would be the perfect last minute project to spruce up my home before the holidays. So instead of using castoff ornaments like the one above, I purchased a couple of packages from the Dollar Tree (each package had one dozen mini ornaments). 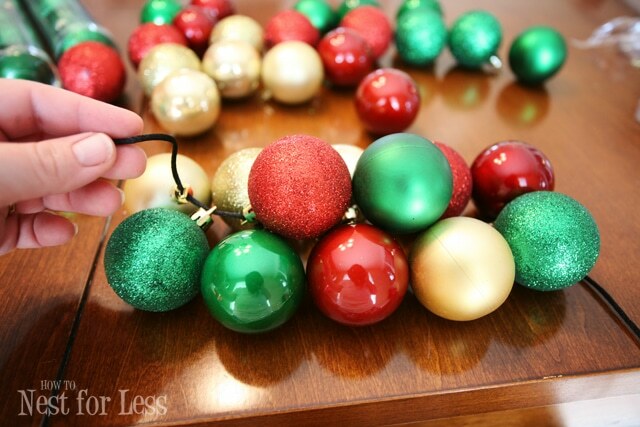 I also got 3 yards of black cord from JoAnn’s fabric to thread the ornaments. Just lovin’ these ornaments from the Dollar Tree! Each package came with gloss, matte and glittery versions. To get started I threaded the black cording through the ornament hook hole. 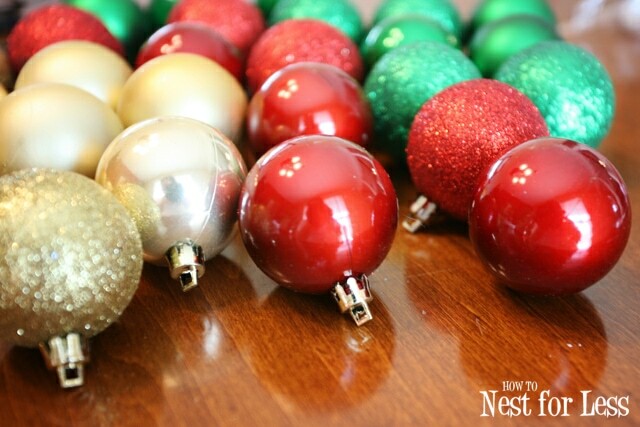 I varied the colors and finish of the ornaments when stringing the garland. Yep, and that’s about it! I used 9 total boxes of the mini ornaments to create my entire garland. Total time to string all the ornaments was only about 10 minutes. 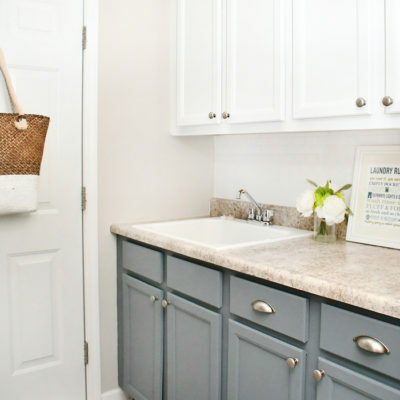 Super fast, easy and cheap project…who doesn’t love that! Isn’t she purdy on my spindled railing leading to the basement! 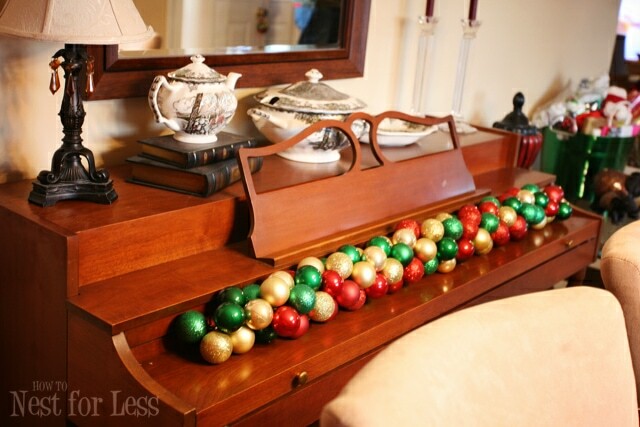 Or stretched across my piano for a little holiday bling! 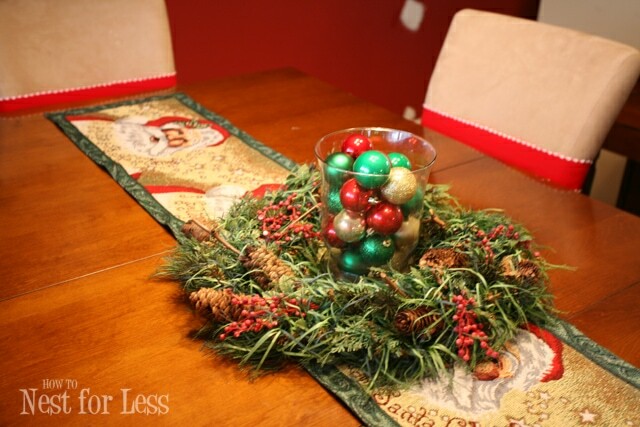 I even used some extra ornaments for a centerpiece on my dining room table. Just an old Christmas wreath with a hurricane glass in the middle filled some leftover ornaments! 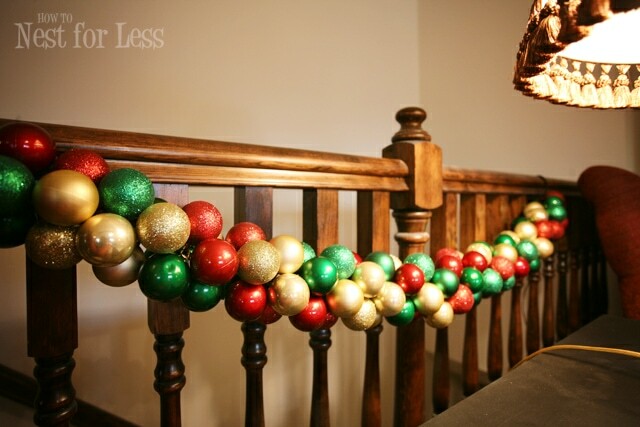 And finally my favorite: two ornament garlands on the banister leading to the lower level with matching sparkly bows! Super easy project, plus it only cost me $10 for each garland! I think I’ll try to scoop up some ornaments on clearance after Christmas to make even cheaper versions for next year! I have a couple more places I’d like to display these around the home next year. 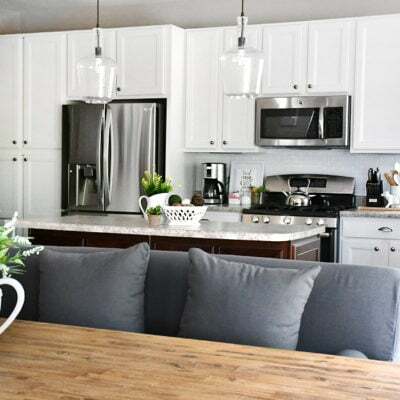 LOVE the pop of color it adds to any room. 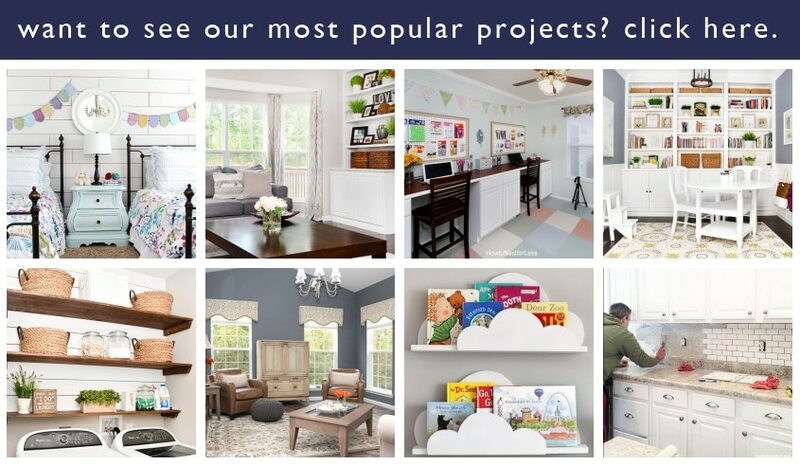 Yep, love finding new projects on Pinterest. I think I’m done creating things for this year’s holiday season, but I’m still pinning away for next year! You can see all of my Pinterest boards by clicking here! I love the mix of matte, shiny and glitter. I looks lovely. Erin-this looks so fantastic! I love it!!! I’m totally pinning this for next year! Thanks for sharing! I love this! And it looks very easy, too. Gives an “elegant” look to Christmas! Cool idea. That might be just thing I need to go on top of our entertainment center. Thanks for sharing. I love this idea. It is so festive and looks to not be terribly hard. Can’t wait to try it!! Love this idea!!! 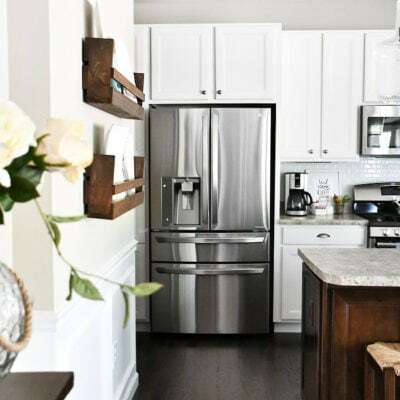 We have a long stair case that just needs garland and this would be a great way to add color without the typical green garland. 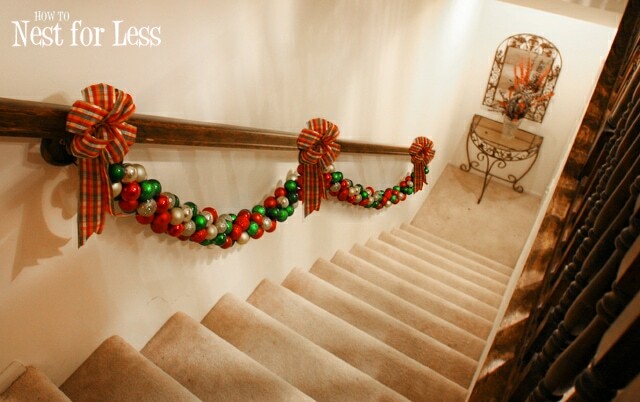 It would cost me over $200 to put green garland on the stairs. And this well it is affordable! Thanks for sharing! Love it!!! Thanks Christine! And don’t forget to stock up now with ornaments on clearance! I absolutely love this!!! 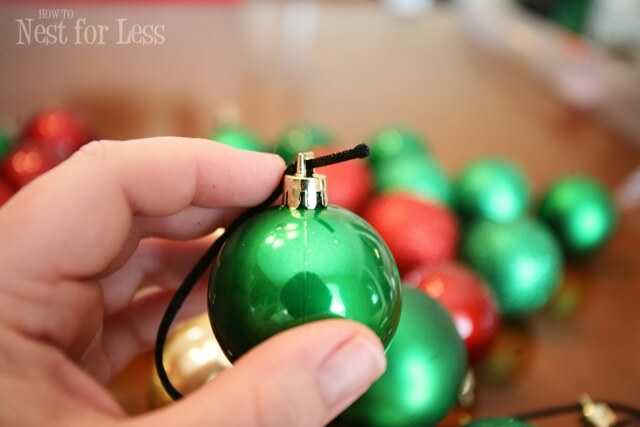 I have lots of ornaments in boxes that I could use to make this. But, if I see any yet on sale — then I am keeping this in mind. 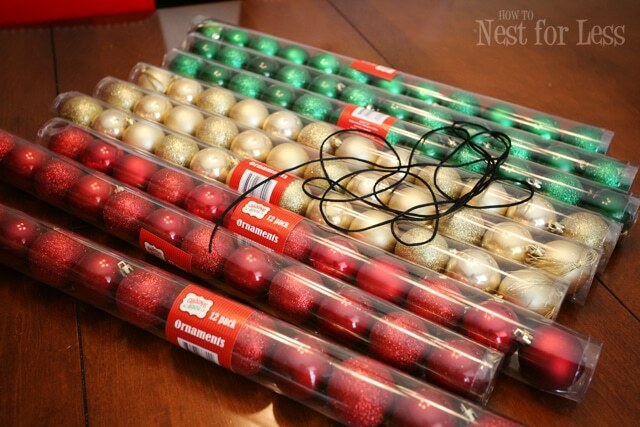 How many feet of garland did you get out of 9 tubes of ornaments? I got about 6 feet of garland.